Is It Good? 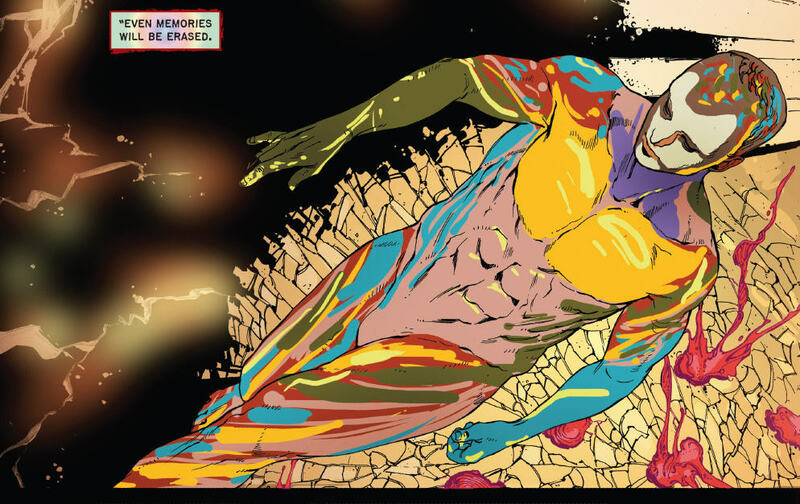 Clive Barker's Next Testament #10 Review – AiPT! If God really did show up one day would he be happy with what he sees? This Clive Barker created story delves into the dark and twisted things that may happen if God did pop his head in for a quick check in. The tenth of 12 issues was released today; is it good? Over the last nine issues Wycke, a god resurrected from an ancient pyramid, has spent his time touring a few cities and checking out what humans have been up to. In doing so he’s basically exploded heads, killed everything in the midwest and committed awful destruction whenever he becomes the slightest bit disappointed in us. At the same time, the man who has awoken this beast has tagged along expecting a lot more fixing and a lot less killing. Unfortunately Wycke doesn’t care about grace and the man has seen terrible horrors. His son has been trying to track them down only to be thrust into danger after danger. Last issue he stumbled across a building housing a library of religious books that may hold the answer in defeating Wycke, or at the very least sending him back into his prison. This series has done quite a good job laying down the social commentary, but a semi-bad job in progressing the story. Generally the formula is ‘send Wycke somewhere new and see what he’ll do.’ This issue kicks off with Wycke going full rampage and preparing the world for utter destruction. That means there’s a hell of a lot of him waxing poetically about destroying us. The comic cuts between this and Tristan as they scour through books. Essentially this book is biding its time with these pieces until a major revelation occurs and a twist you never saw coming hits on the very last page. The book opens with some major anti-god sentiments. Writers Mark Miller and Clive Barker do a bang-up job on the dialogue in Tristan and Espeth’s scenes with plenty of little comments by them that are either witty or cute. That keeps the brain interested at the very least. The plotting works well in a sense, although I found Tristan to be oddly aloof for a guy who’s expecting the world to be destroyed in a matter a minutes. The characters have always been oddly disconnected in this series though, so there isn’t much changed there. A bit of a yawn here. Artist Haemi Jang does a good job with the Tristan scenes as well as he’s expected to. Watching characters flip through books isn’t the most riveting of subjects to draw I’m sure, but he manages to complement these with some epic double page spreads of Wycke taking out the planet. There’s some reality altering stuff going on and it’s trippy to say the least. The book is changing gears considerably, especially due to the event on the last page, but the general horror and mayhem that’s made the entire series great is still there. Recommended.